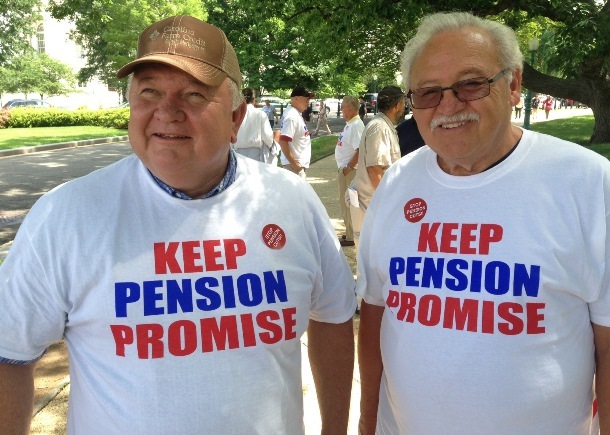 Retired union members came to Capitol Hill recently to support the introduction of the Keep Our Pension Promises Act, a bill that would restore anti-cutback provisions for current retirees. Congress snuck a cruel provision into last year’s must-pass spending bill, allowing troubled multiemployer pension plans to cut already-earned benefits for current retirees, many of whom gave up pay raises for the promise of a secure retirement. More than 10 million Americans depend on a multiemployer pension plan for their retirement. There is an alternative to leaving our retirees out to dry. The Keep Our Pension Promises Act (S. 1631, HR. 2844), introduced by Sen. Bernie Sanders (I-VT) and Rep. Marcy Kaptur (D-OH), would restore the anti-cutback rule in the Employee Retirement Income Security Act (ERISA) and strengthen multiemployer pensions. TAKE ACTION: Tell your Senators and Representative to co-sponsor the Keep Our Pension Promises Act. The IAM has firsthand experience with a well-run pension plan. The IAM’s National Pension Fund has over 1,750 contributing employers and is the 5th largest multiemployer plan in the U.S. With assets of nearly $11 billion the IAM National Pension Fund provides retirement security to over 90,000 retirees and beneficiaries. READ MORE: IAM General Secretary-Treasurer Robert Roach, Jr. endorses the Keep Our Pension Promises Act.